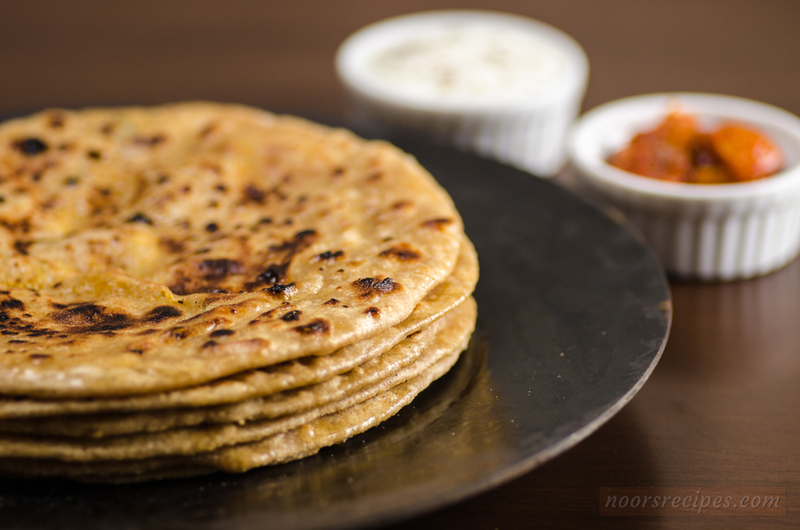 Easy Mooli Paratha recipe by Mum. Make your breakfast simply delicious! Grate the radish and squeeze out as much water as you can. You can use this water to make the dough. In a large bowl add the flour and salt, mix it well. Then add the radish water little by little to make a soft dough. Add the oil and knead it well. Keep it aside covered for 10-15 minutes. Add all the ingredients from green chilies to salt to the grated radish ( Do squeeze out the excess water if any from the grated radish) . Slightly crush the cumin seeds, finely chopped green chilies and garlic before adding. You can add radish leaves if you wish to instead of the coriander leaves. Divide the dough into equal portions and make small balls. Flatten each ball a little and place the stuffing inside, then bring all the edges together and seal it completely so that the stuffing doesn’t come out. Now roll this with a rolling pin to make a paratha to the thickness you desire. Heat a tawa and shallow fry with oil or butter on both sides on medium flame till golden brown. Serve hot with curd (sprinkled with pepper) and any pickle of your choice. Variation: For those who do not wish to make a stuffed paratha, here is a simple method to make these yummy parathas quickly. Add all the ingredients to the wheat flour with little water if required and knead it well with oil into a soft dough. Divide the dough into equal portions and roll them into thick parathas. This entry was posted in Uncategorized and tagged breakfast, mooli paratha, paratha, radish paratha. Bookmark the permalink.